A Beautiful Life has a collection of perfumes that are cutesy-cool and unlike anything you’ve ever smelled. Pictured above (a top Lisa Frank #FBF) is their signature I Heart Unicorns and a new one called Composition - in lure of the BTS season. We are a little obsessed with I Heart Unicorns… mostly because it’s a delicious and juicy melange of bright aromas that send us straight back to the 90’s when all of our paper products had a bit of rainbow on them. 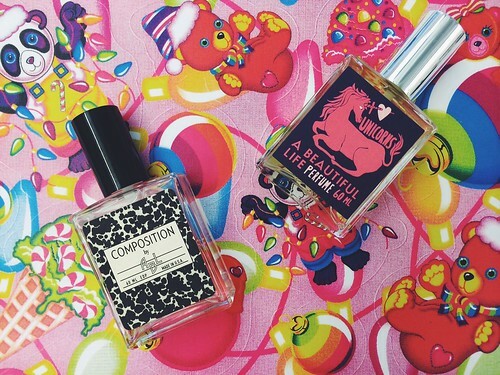 If Lisa Frank had a smell, it would be I Heart Unicorns. Composition captures the bitter-sweet essence of going back to school with a hint of tart green apple and a whole lot of crisp paper and cozy sweaters. Get anywhere near this fragrance and I guarantee you will be rushed into a wave of middle school nostalgia.